Aphids in many Southern California vegetable gardens are particularly bad this winter. What a good opportunity to test some control methods and make observations about aphid behavior. Brevicoryne brassicae, that’s the scientific name for the particular aphid I’m talking about. As you can see, it’s named after its host plants: members of the Brassica genus, also commonly called cole crops, and sometimes called cruciferous vegetables. 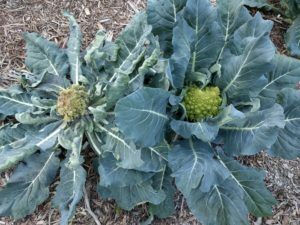 In addition to broccoli, brussels sprouts, cabbage, and cauliflower, this includes kale, mustard, kohlrabi, romanesco, and collards. And as you can see in the photo above, the little buggers appear gray although under that waxy coating they’re actually green. It’s been a very warm winter for us in Southern California. As it stands here on February 2, 2018, we’ve had a single day of rain, nearly every other day having been sunny and warm. Aphids love sunny and warm. Just like us, they go into a sort of dormancy when it’s very cold or hot, but revel in warm. That’s why in a normal year their population explodes around March, in between the chill of winter and heat of summer. This year so far, however, it’s been warm like spring through the whole winter. The result? A great aphid year! — if you’re a ladybug. I’ve had more ladybugs crawling and fluttering around my garden than in any January I can recall. 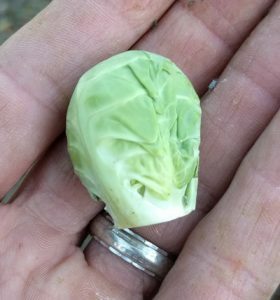 Lift up any leaf on a brassica plant and you’ll find a handful. Why? They’re hanging out close to their food, the aphids. If only ladybugs ate more aphids. 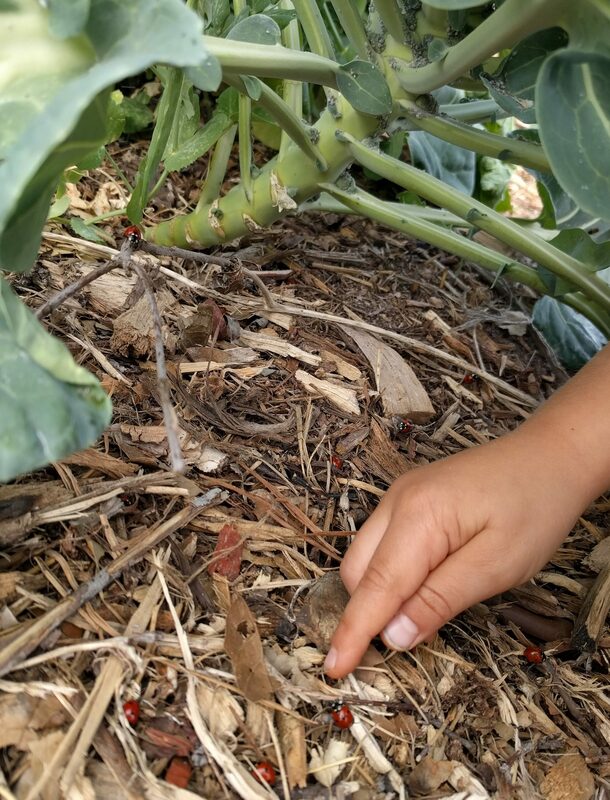 The kids love having so many ladybugs to pick up. This perfectly aligns with my experience, unfortunately. I’ve never sprayed any sort of pesticide in my yard, but still natural enemies of the aphids can’t control them well enough. 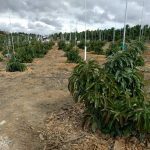 What harm do the aphids cause? But let’s back up and ask what’s so bad about aphids, anyway? 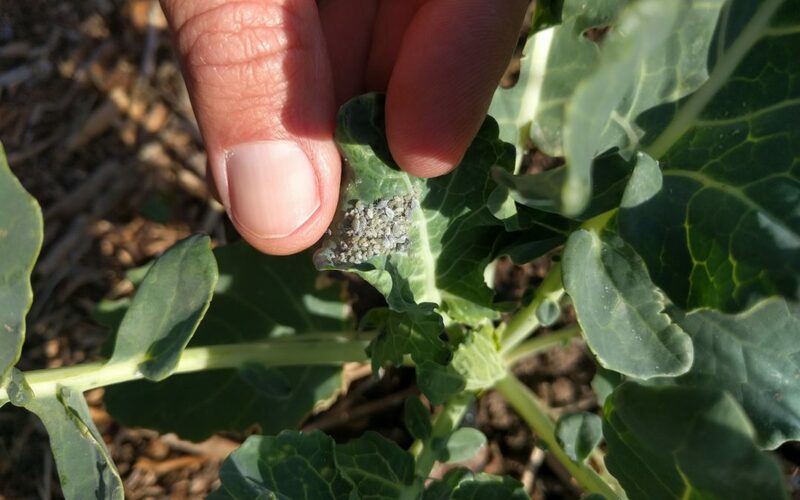 If allowed to colonize on a young brassica plant, aphids can grow to overwhelmingly high numbers and nearly kill the plant. They do this by literally sucking the juices from the leaves. 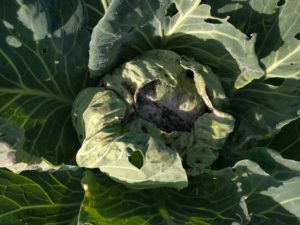 Aphids have nearly killed this cabbage. At lower numbers, aphids are more of a nuisance than a killer. 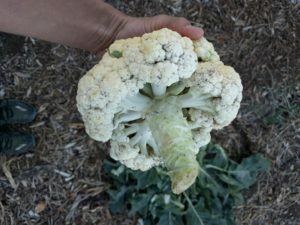 For example, I harvested this head of cauliflower the other day. 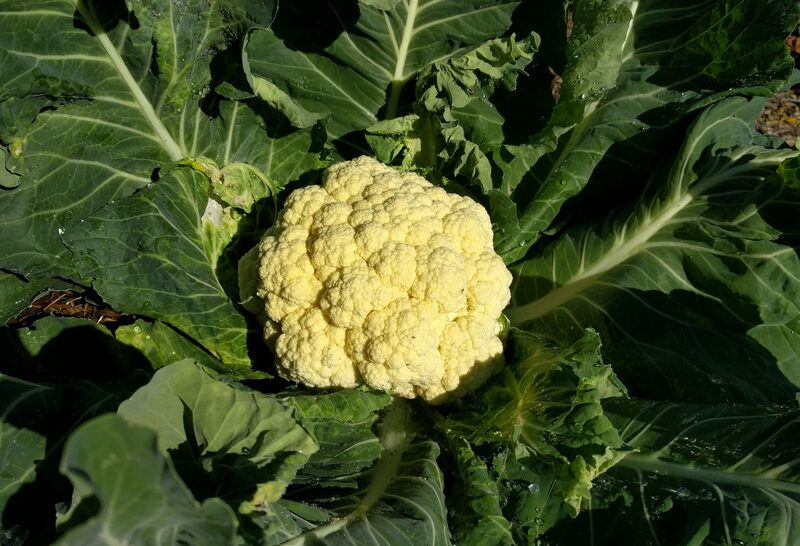 ‘Goodman’ cauliflower ready for harvest. Before harvesting, I blasted the head with water because I had noticed a few aphids. But then, upon cutting the leaves away from the head, I turned it over to find hundreds more holed up in the florets. More than a nuisance, more than gross, it was something of a heartbreak. 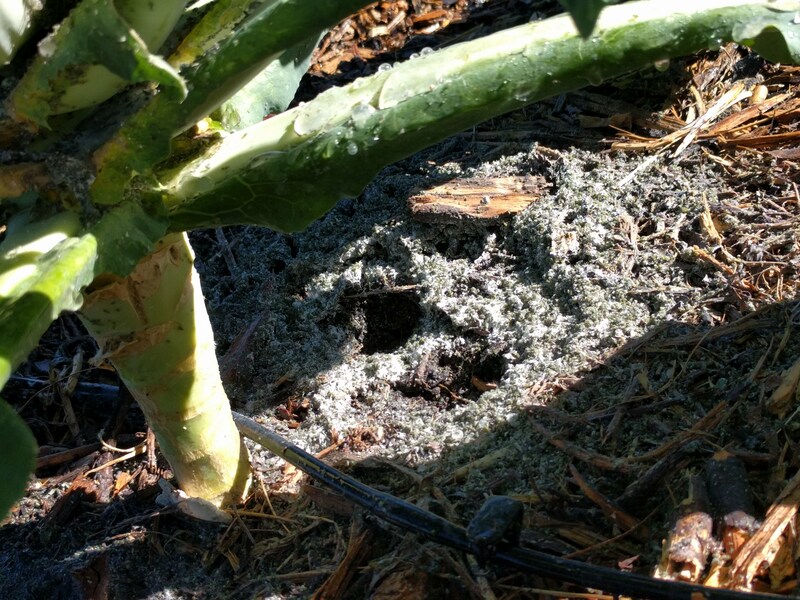 Months of hopeful caring for the cauliflower plant had been ruined by the discovery of these invading insects. Aphids invade a bed of brassicas in a curious pattern. 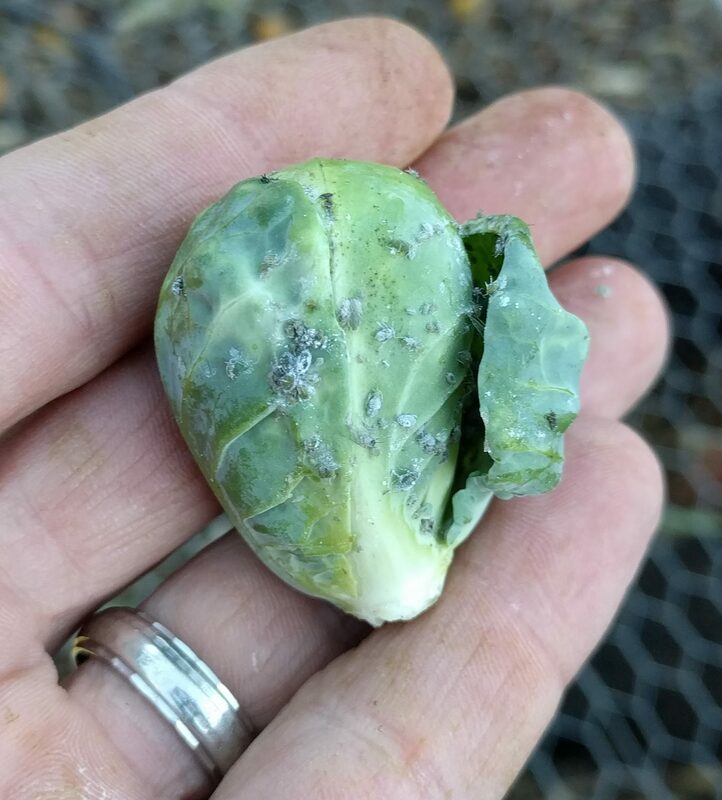 I’ve observed this on every type of brassica I’ve grown, and it has occurred consistently every year. In short, the pattern is that adjacent plants have extremely variable levels of aphids. You might think that they’d spread themselves out among all of the plants, but no. There might be one that is terribly infested while the next, whose leaves are touching, has no aphids at all. 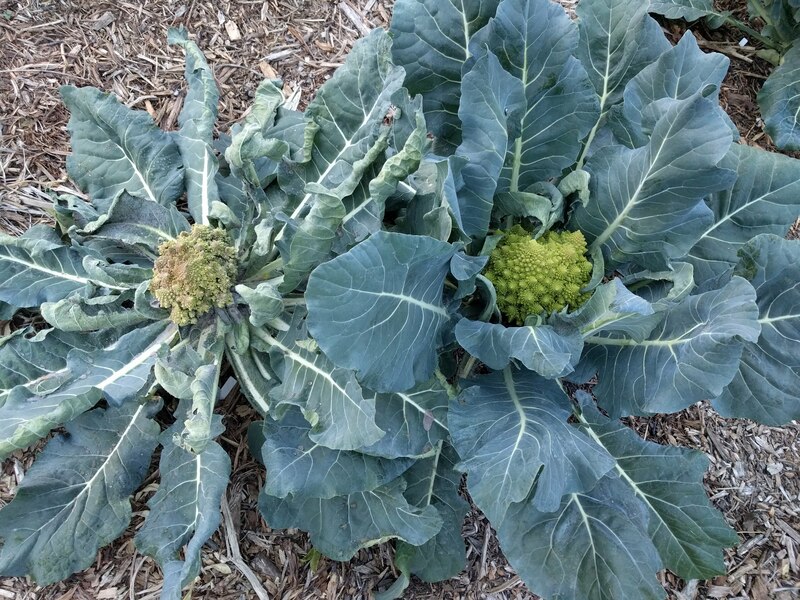 Romanesco on left, destroyed by aphids. 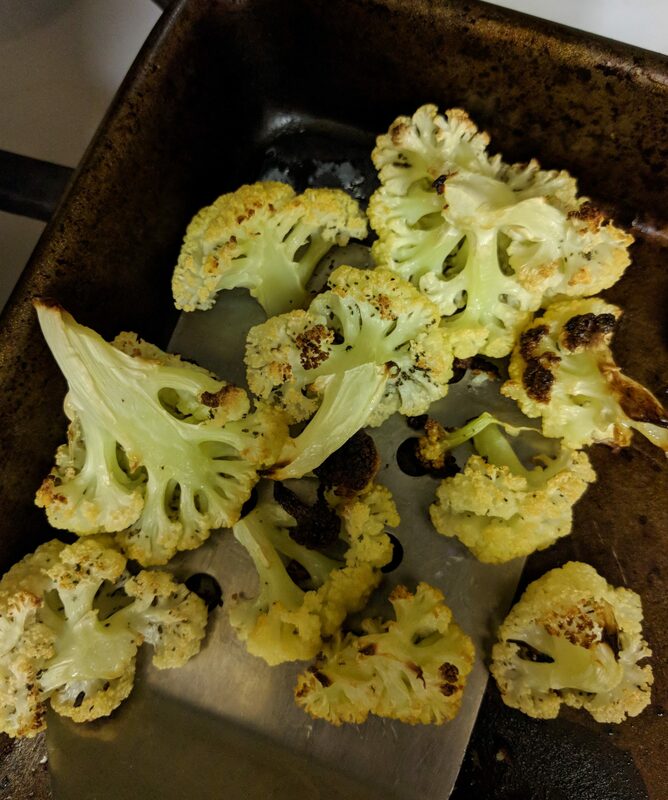 Romanesco on right, ignored. Because of this pattern, my approach to aphids in the past has been to just do nothing. I accept that they’ll decimate a plant here and there, which I then feed to the chickens (who also eat aphids), but they leave most untouched or barely touched. And having some aphids around as food for beneficial insects is smart, I’ve figured. I don’t want to try to eliminate them entirely. That has worked decently in the past, but not in a bad aphid year like this one. This year, the aphid population and aphid damage has been too high for my standards. In the bed of Romanesco from which I took that photo, out of the six plants, three went to the chickens. Normally, it might be zero or one, max. So I’ve had to try out a couple of extra control methods. “Roguing (removal and destruction) of infested plants from the field can be effective early in the crop cycle,” says the UC IPM page. Instead of sacrificing a plant to aphids and leaving it in the bed, I’ve started to remove plants that are particularly attractive to aphids. As I said, they go to the chickens, so all is not lost. But I’d love to find out what it is that attracts aphids to some plants and not others right next door. Anyway, roguing has apparently been of some benefit over the last few weeks. It’s hard to tease out the effects of my roguing though because I’ve also started a more consistent regimen of water blasting. 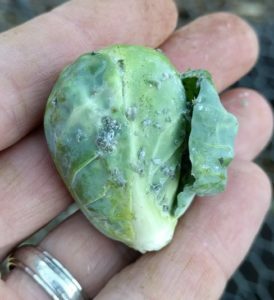 Aphids are easily knocked from the leaves of brassica plants with a strong spray from the hose. I put one hand under the leaves of young plants to support them, and I also make sure to lift leaves to spray the undersides, where aphids often hide. Another place you can’t forget to blast is within the rosette of tightly curled leaves in the center of the plant. After the storm, you can see the graveyard beneath a plant. Not really a graveyard, some of the aphids are still alive, and you’ll see a few crawling back up the stem before long. Many will desiccate and die right there though. As long as you come back and blast the plant again before too long, the aphid population can be kept in check very well. This year since there are a lot of aphids, I try to blast every couple days. I’ve also used the technique of wiping the aphids off with my fingers, but I mostly prefer blasting. Wiping aphids really ends up being squishing aphids. You end up with sticky aphid guts covering your fingers, as do the plant leaves. And there must be some substance in aphid guts that is toxic to the leaves because they always look discolored and slightly distorted afterward. 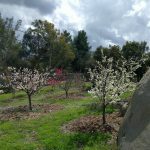 Plus, if you’re blasting with water then you’re also giving the plants a little drink which can’t hurt in a dry winter such as this. The longer I garden, the more I wish I could bottle and sell the effects of consistently blasting plant foliage with water. It seriously cures almost everything. Mites, scale, aphids. A couple of methods of managing aphids that I’ve yet to use are row covers and pesticides. 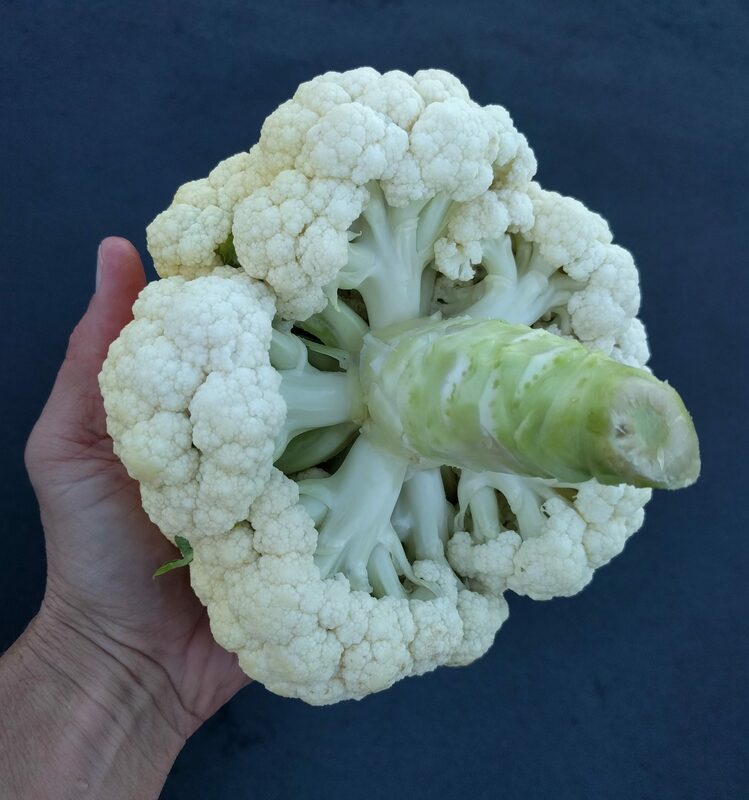 So I’m sorry that I don’t have first-hand experience to draw from here, however, a Southern California farmer I know uses row covers on his brassicas and they turn out beautifully. Row covers are those white sheets you may have seen on fields while driving through an area like Oxnard. 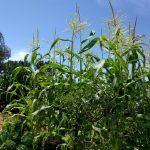 They can serve many purposes, but one is to keep bugs off crops. 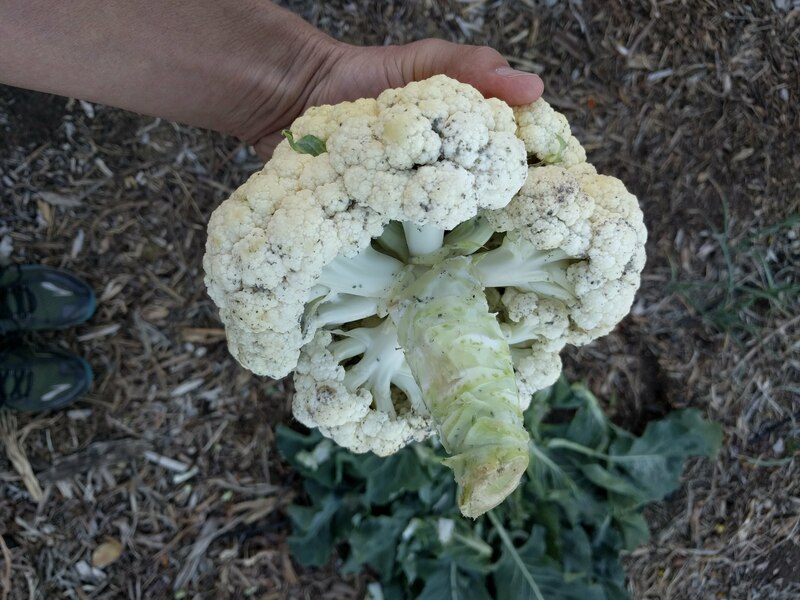 This farmer says he only removes his row cover once the plant, say broccoli or cauliflower, has started forming a head. At that point he sprays it with a pesticide, specifically an insecticidal soap, if necessary. My sense is that brassicas are sprayed with pesticides routinely by farmers. The University of California Integrated Pest Management webpage for these specific aphids is actually written for farmers more than us home gardeners, and it says, “Most fields require at least one [pesticide] application at preheading.” It goes on to say, “Treat as soon as 1 to 2% of plants are infested with one or more aphids.” That seems like a very low threshold to me, but imagine the raging complaint or even lawsuit waiting for the farmer that sells a head of broccoli with a single aphid on it. 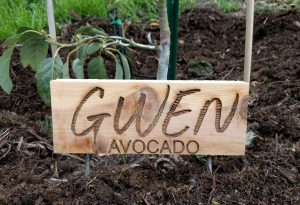 Now peeled and sprayed with water. But notice the aphid on my finger. You’re never going to get every single one. I do this same thing to clean up my heads of cabbage when necessary. Still, don’t look too closely. 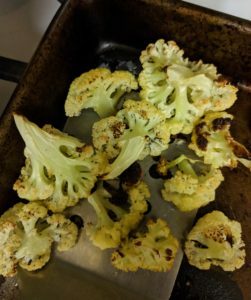 You chop it up and roast it, maybe add a little crushed black pepper and any stragglers blend right in. Thanks for the info. Darn critters! 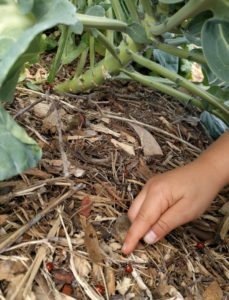 The bugs have been especially bad this year- moths, spiders, earwigs… I’m working on eliminating the grubs that grow into Japanese beetles in my garden. 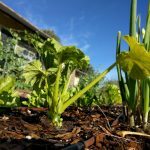 After consulting with a couple of local nurseries and a friend who knows agriculture, I’ve gone the nematode route instead of pesticide. We’ll see if that works. Fingers crossed! I’ll let you know! Oh, never heard of nematodes controlling beetles. Interesting. Keep me posted. Hi..great article! Im having the same problem, have you tried the soapy spray solution with reg dishsoap?? I have no problem hosing them down, just wondering if a soapy spray will do the trick..or is it just a myth ? I have not tried regular dish soap. If you try it, please let us know what you observe. Also try to compare it to just spraying water.